When you choose to live a generous life, you start to change the world around you. Something incredible happens when giving is our idea and not a duty or obligation. When you move from awareness to action, miracles happen. As you make giving a lifestyle, you&rsquo;ll realize you&rsquo;re not only loving life more, you&rsquo;re also creating a more generous world&mdash;a better world for all of us. I Like Giving is about experiencing the joy of giving. We all have something to give. Giving goes way beyond money or things. It can be a listening ear, a touch, or simply the gift of time. Giving is living. BRAD FORMSMA is the creator of Ilikegiving.com, a website viewed in more than 165 countries, which inspires people to live generously through its short films as well as a platform for all to share their experiences in giving. Brad and his wife, Laura, have three children and live in Grand Rapids, Michigan. with their families, eating turkey and watching football? donor, and before Tracy could ask any questions, he handed it over and left. Tracy was so overwhelmed that she spent the rest of the day crying. Surprised and amazed, Tracy decided she needed to know whom to thank for this extravagant and timely gift. However, she couldn&rsquo;t fi gure it out. She called her parents, but it wasn&rsquo;t them. She asked her friends, but no one knew. Tracy couldn&rsquo;t believe that someone outside her circle of friends and family had noticed her situation and done something about it without drawing any attention to himself. Years went by, and Tracy still had no idea whom the mysterious Thanksgiving dinner had come from. In time she moved out of that apartment and began working as a nurse at a local hospital. And then it happened. Seven years after that special Thanksgiving meal, a woman named Margot was admitted into Tracy&rsquo;s care. Margot had multiple sclerosis, and her condition was becoming critical. Tracy remembered Margot from her time on welfare. She had lived in the same apartment building as Tracy. It was clear that Margot didn&rsquo;t have much longer to live. In that moment Tracy knew who had given her that Thanksgiving dinner. She would never have guessed that Margot&mdash;the unassuming neighbor with multiple sclerosis&mdash;was behind that generous gift. Tracy still gets tears in her eyes when she tells the story today. I&rsquo;d call that story &ldquo;I Like My Neighbor.&rdquo; Margot saw Tracy&rsquo;s situation that Thanksgiving Day and did something extraordinary&mdash;she gave her the perfect gift without anyone asking her to and without asking for anything in return. That one gift had a massive impact on Tracy&rsquo;s life. Moved by the anonymous donor&rsquo;s generosity, Tracy purposed in her heart to do generous things for other people too. The very day she got off assistance, she took a basket of gifts down to the welfare offi ce for anyone to take. The welfare offi cer was stunned. Can you imagine the look on his face? Who does something like that? Year&rsquo;s resolution to fi nd one hundred opportunities to give to other people. How inspiring is that? What I appreciate most about Tracy is that she doesn&rsquo;t do her giving to be noticed by others. Since that Thanksgiving Day in 1993, she has discovered the joy that comes from giving. Now she&rsquo;s hooked. She doesn&rsquo;t give to make herself look good&mdash;she gives because she likes giving. It makes her feel more alive. &ldquo;It&rsquo;s how life should be,&rdquo; she says. There is something incredible about giving when it&rsquo;s our idea. Opening our eyes and ears to the people around us and asking &ldquo;How can we give?&rdquo; is a profoundly life-giving and satisfying way to live. One of Jesus&rsquo;s ideas was that it is more blessed to give than to receive. I have found that to be true. The generous life is the only life worth living. Just imagine&mdash;what if every single person on the planet woke up and, like Tracy, looked for ways to give? What sort of world could we create through the simple, powerful decision to live generously? Whoever you are, no matter how much or how little you have to share, making the decision to give regularly to others&mdash;daily, weekly, or monthly&mdash;will enrich your life and change the lives of the people around you. When we choose to give, we change, and the people around us change. When we move from awareness to action, miracles happen. When we allow giving to be our idea, a world of possibilities opens up before us, and we discover new levels of joy. If you, like Tracy, get hooked on giving, you&rsquo;ll fi nd yourself asking, &ldquo;How generous can I be?&rdquo; When that happens, you&rsquo;ll realize that, not only are you loving life more than ever, but you&rsquo;re also a part of creating a more generous world&mdash;a world that is better for all of us. 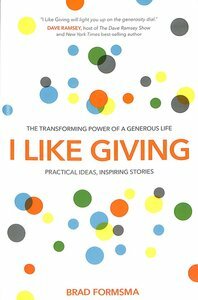 If you haven&rsquo;t ever experienced the joy of giving, or it&rsquo;s been a long time, this book will show you where to start. We will walk with you as you take your fi rst steps, and we&rsquo;ll stick with you as you grow in the art of generosity. Or if you&rsquo;re nodding your head right now, saying, &ldquo;I&rsquo;ve known this for years,&rdquo; then we&rsquo;re here to encourage you to keep growing and to empower you to spread the joy. We never arrive. I&rsquo;ve been discovering the joy of generous living for many years, and I still feel as if I&rsquo;m just getting started! The best things in life are like that&mdash;they grow and never end.